Critical Mass—the name inspires passion and loathing. Originally a term applied to nuclear fission, it has become a rallying cry for bicyclists, rejecting the priorities and values imposed on us by oil barons and their government servants. But Critical Mass bicycle rides are no protest movement as we commonly imagine. Instead, riders have gathered to celebrate their choice to bicycle, and in so doing have opened up a new kind of social and political space, unprecedented in this era of atomization and commodification. Bicyclists are reclaiming city life from San Francisco to St. Louis, Melbourne to Milan, Berlin to Bombay, and hundreds more cities across the planet. Critical Mass started in San Francisco in the dark days of 1992 not long after Bush #1 had manipulated Iraq into becoming the new boogeyman, massacred thousands in the Gulf War and declared a New World Order. Critical Mass had already spread to over a dozen cities by the time the Zapatistas rose on New Year’s Day in 1994 (against the “free market” neoliberal deal NAFTA was shoving down Mexico’s throat). Since the Zapatista uprising, the myriad movements contesting corporate globalization have grown in the shadow of the famous “irrational exuberance” of the 1990s. Alternative seeds have sprouted into thickening branches of oppositional and visionary movements, from Reclaim the Streets to community gardening to the summit-hopping Turtles and Teamsters. Over 2,000 cyclists take to the streets in a monthly "organized coincidence" called Critical Mass. 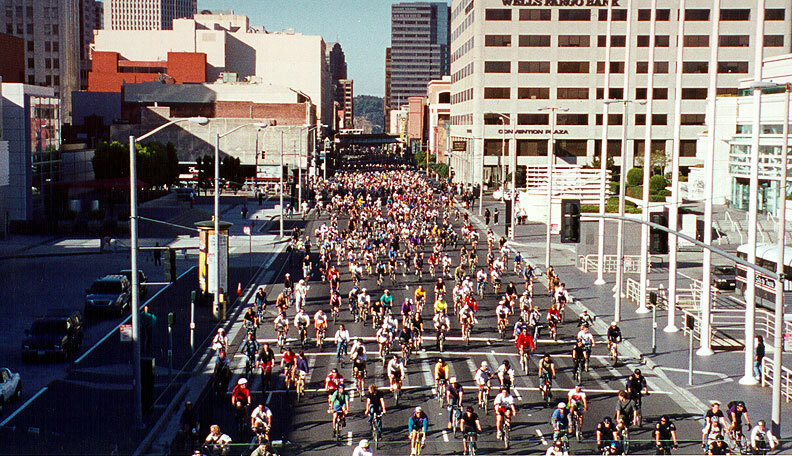 Spreading to over 400 cities around the world, Critical Mass began in September 1992 in San Francisco with 45 riders, and has happened every month since, averaging about 1,500 riders and topping 5,000 riders on several occasions. Here the ride descends the famous Lombard Street heading east in July 2007. Police attack Critical Mass, July 1997, in San Francisco. Critical Mass is not a protest but a demonstration, in the simplest sense of the word. It is a demonstration of social space, the rarest bird in America. It works, because people automatically feel it’s right, though many of us have never before experienced free public space. Critical Mass cut through the noise and inertia of the American transportation system and taught us to carve a wedge of our city for ourselves. It feeds us a reality we use to create a vision. With no knowledge of history or sense of possibility, we assume that the way things are is the way things ought to be. Just because our home is friendlier to autos than humans doesn’t mean it ought to be that way. Critical Mass gave us knowledge and a sense of possibility bigger than any rhetoric, any architectural model, any developer’s ad campaign, or any promise. We humans want social space, we need it, take to it like ducks to water. After 10 years of massing, we found out that the society we want isn’t so unobtainable after all. That’s liberation. Thanks, Mass. This short essay appeared originally in "Critical Mass: Bicycling's Defiant Celebration" published on the 10th anniversary in 2002 by AK Press. 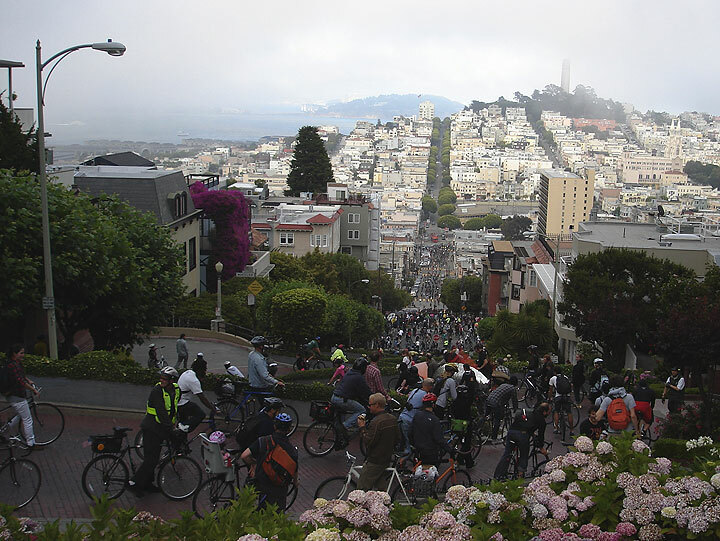 Ongoing discussion and debate about Critical Mass in San Francisco here. WHITHER BICYCLING? Tepid Reform or Utopian Revolt?